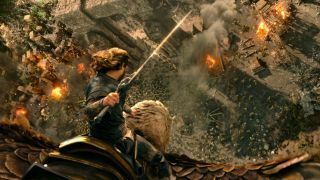 Four new glimpses of Duncan Jones' epic fantasy flick. The Warcraft movie is only weeks away. On May 30 in the UK and June 10 in the US, we will finally have the chance to see what Duncan Jones' ambitious attempt to bring Azeroth to the big screen. If you can't wait for then, four new clips have been uploaded showig a (surprisingly violent) brawl, some magic and a jovial chat between old Orc pals. The best bit is probably the part where an Orc thows a horse at some men, but it's also nice to see Orcs kick back for a while to admire the ashen wastes of their dying homeland. Cheer up, friends, I'm sure it will all end amicably.